A saw (for woodworking) is a tool consisting of a blade of metal with a sharp toothed edge which is used to cut through a piece of wood. 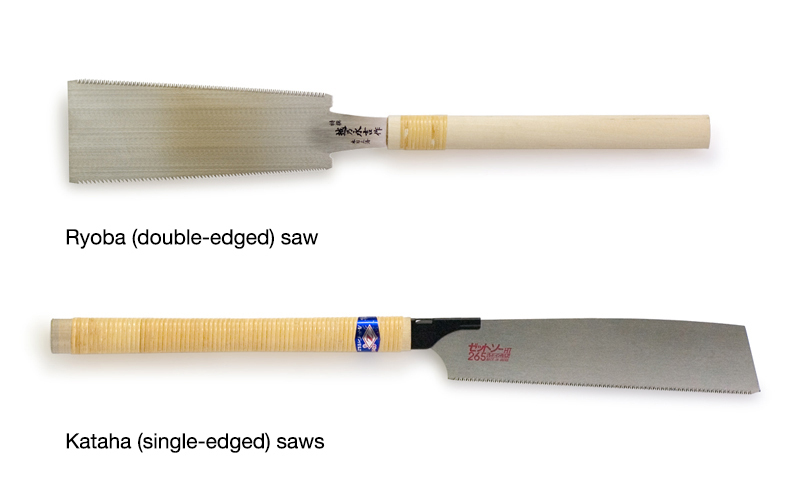 Generally, Japanese saws cut on the pull stroke whereas Western saws cut on the push stroke. Two types of saws are mainly used for woodworking: rip saws used to cut parallel to the wood grain, and crosscut saws used to cut wood fibers horizontally at right angles to the grain. The blade of a rip saw is coarse and that of a crosscut saw is fine. When viewed from the front, the teeth on the blade are splayed out at an angle alternately on the left and right of the blade. This is called a “set” (asari) and has the role of reducing friction between the wood and the saw blade, thus making it easier to move the saw back and forth, and discharging the sawdust. When cutting a piece of wood, it is important to consider the width of the blade and its set before deciding on the cutting method and dimensions. 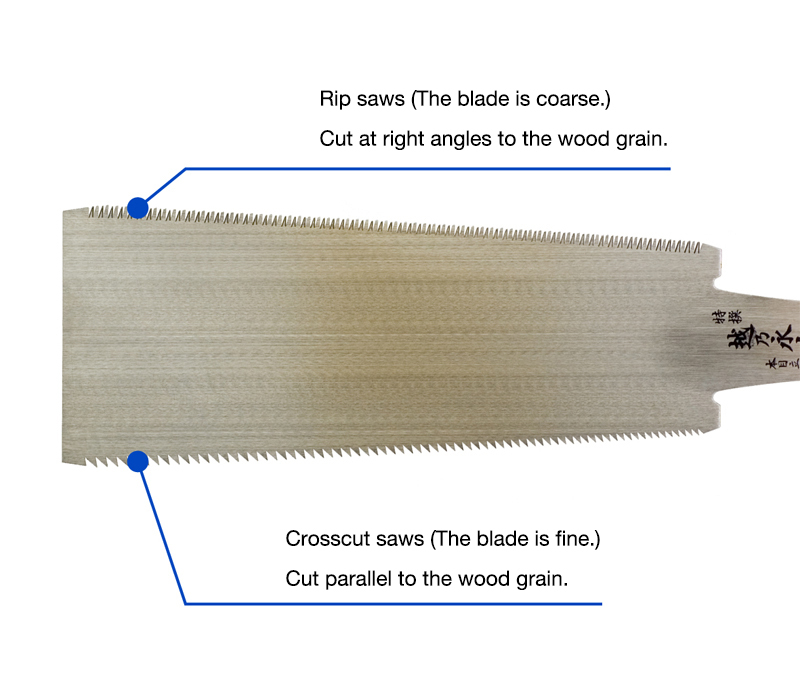 The most common type of wood saw in Japan is the ryoba (double-edged) saw with a rip blade on one side and a crosscut blade on the other. Single-edged kataha saws can either be a rip saw or a crosscut saw. With some products, the blades are replaceable. A douzuki saw (backsaw) can be used for precise cutting or when a clean incision has to be made. Because the blade is thin and bendy, this type of saw is reinforced with a metal spine on the edge opposite the cutting edge. The azebiki is another type of saw which is used when making grooves on the surface of a wooden board. A hikimawashi saw (Japanese version of keyhole saw) is useful for cutting out curves. Saws have a very long history. Metal saws were already in use by around 1500 BC in ancient Egypt. Those unearthed from the 5th century burial mounds are known as the oldest saws in Japan and they underwent changes with the arrival of woodworking tools from China in the 6th century. 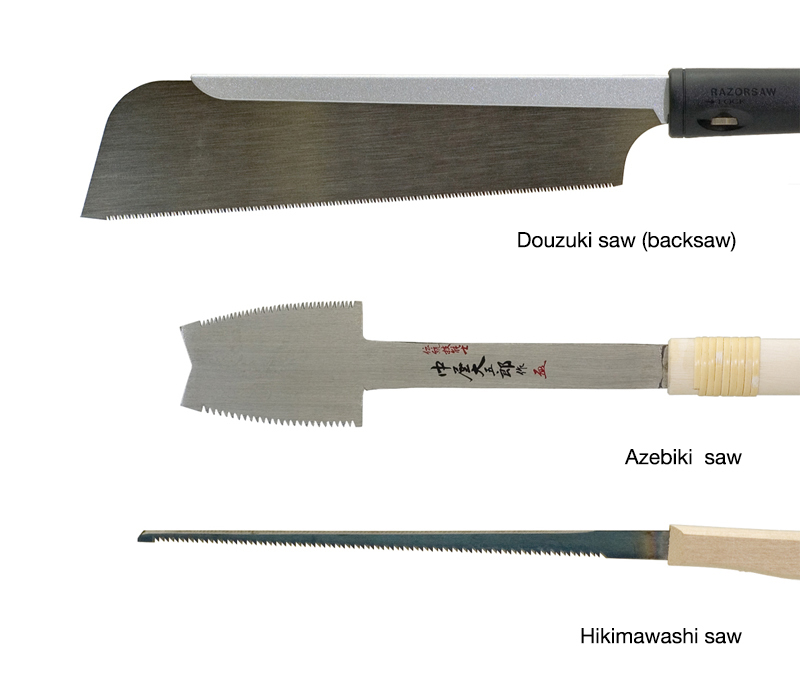 Most of the various types of saws used today took their final shape in the Edo period. Wood shavings and dirt should be wiped off the saws after use. Saws that have become blunt can be sharpened by filing (metate). Various types of saws can be purchased at home centers and hardware stores.